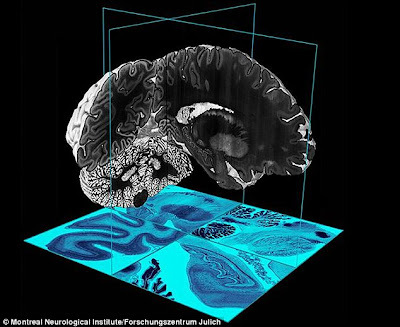 Researchers have created the first high-resolution 3D digital model of the human brain, which they have called "Big Brain". The reconstruction shows the brain's anatomy in microscopic detail, enabling researchers to see features smaller than a strand of hair. It will be made freely available to neuroscientists to help them in their research. The model has been published in the journal Science. The research team had to slice 7,400 sections from the brain of a deceased 65-year-old woman, each half the thickness of a human hair. 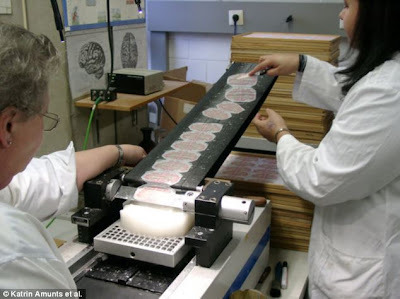 The team then had to stain each slice to bring out the anatomical detail and scan them into the computer in high definition. The final step was to reassemble the scanned slices inside the computer. 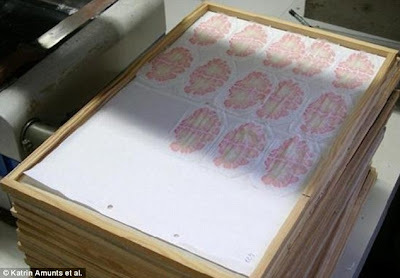 In all, 80 billion neurons have been captured in this painstaking process which took 10 years to complete. The result is a 3D high definition digital brain into which researchers can zoom to study areas of interest in microscopic detail. One of the researchers involved, Prof Katrin Amunts from the Julich Research Centre in Germany, said that it was "like using Google Earth. You can see details that are not visible before we had this 3D reconstruction". Another member of the team, Prof Alan Evans of McGill University in Canada, described the achievement as a "technical tour de force". Among the neuroscientists who will be using Big Brain is Prof Paul Fletcher, a psychiatrist at Cambridge University who is scanning the brains of patients to learn more about eating disorders. Big Brain, he says, goes a "step further" than the best scans he can obtain by enabling him to see details at the level at which brain computations take place. "We will be able to study the responses seen in people and map it on to an atlas that goes close to the individual layers of the brain's cortex, to the very cells themselves". Big Brain is one among many recent big neuroscience initiatives. 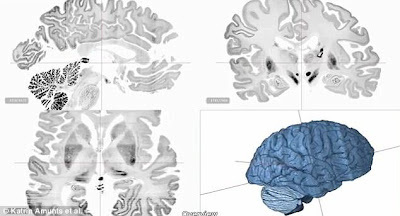 Researchers in the US have recently begun a £24m Human Connectome Project which involves incredibly detailed scans to show the connections between important areas of the brain. A few weeks ago President Obama announced a £64m initiative to map the human brain to help find cures for disorders such as Alzheimer's. And the European Union has proposed a billion pound programme that will in effect create a brain from scratch using computer technology. Among the biggest investors in brain research is the Wellcome Trust which invests £80m each year in the field. "Disorders of the brain and mind such as dementia and schizophrenia and depression are a major burden on society. "For a funder like Wellcome the challenge is how we build knowledge that will allow us to develop drugs and therapies that can help patients and their families."